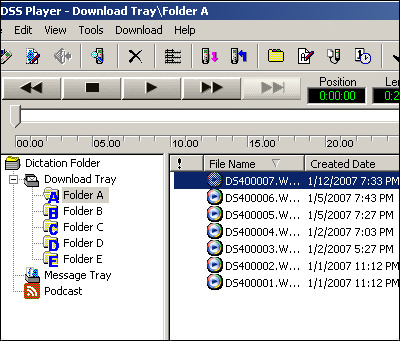 A ds2 file extension is associated with the Olympus Digital Speech Standard used by Olympus digital recorders and used for its audio files. What is ds2 file? How to open ds2 files? The ds2 file extension is used for DSS Pro file format (Digital Speech Standard) that is used by Olympus DS-2400, DS-5000 and other digital recorders developed by Olympus. DSS format reduces memory requirements and transfer times with minimal quality loss. It does exceptionally well in handling of audio files. Olympus DSS Player Lite is used to playback audio notes from Olympus Digital Voice Recording products. Use Olympus DSS Player Lite to playback *.ds2 audio files. Use compatible app to export *.ds2 to other formats. and possible program actions that can be done with the file: like open ds2 file, edit ds2 file, convert ds2 file, view ds2 file, play ds2 file etc. (if exist software for corresponding action in File-Extensions.org's database). Programs supporting the exension ds2 on the main platforms Windows, Mac, Linux or mobile. Click on the link to get more information about listed programs for play ds2 file action.